David Utterback (1955-2007) grew up in the Adirondack Mountains of upstate New York, where he began collecting butterflies and moths at an early age. This interest led to a degree in Entomology from Syracuse University. After college, David moved west, and in the early 1990s, he settled in Portal, Arizona – a small community known for its exceptional biological diversity. 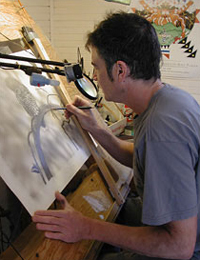 He subsequently embarked on a full-time career as a wildlife artist.